Fire can destroy a house and all of the possession­s in it in less than an hour, and it can reduce an entire forest to a pile of ash and charred wood. It is a terrifying weapon, with nearly unlimited destructive power. Fire kills more people every year than any other force of nature. But at the same time, fire is extraordinarily helpful. It gave humans the first form of portable light and heat. It is also important for home and industrial use, therefore we cannot do without a fire. However, having sufficient fire safety equipment within a commercial environment and home is vital for the health and safety of man and properties. The importance of portable fire extinguishers cannot but be emphasized because it has an even more vital role to play as a first aid response to fire outrage. Though the Fire service can be called upon but with the present condition of our country where traffic is now the order of the day in every location before the team gets to the venue the damage done might be too grave for repair. Class A refers to those involving carbonaceous materials such as cardboard, fabric, or wood. Class B to fires involving flammable liquids such as gasoline, kerosene, grease, oil, and other combustible liquids. Class D to metal based fires. Class F is for fires involving cooking oils and fats. Water and Foam fire extinguishers extinguish the fire by taking away the heat element of the fire triangle. Foam agents also separate the oxygen element from the other elements. This type of extinguisher can only be used for a very small fire thatis, they are for Class A fires only – they should not be used on Class B or C fires because it could cause more damage than cure. 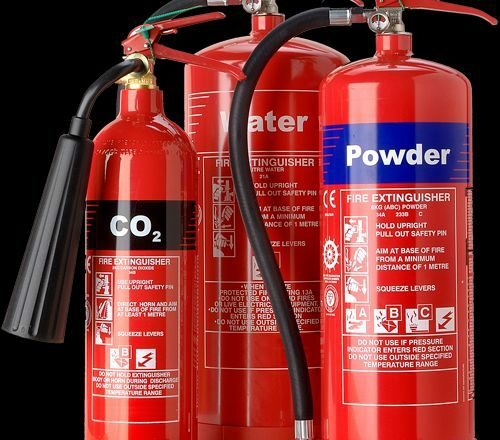 Carbon Dioxide fire extinguishers extinguish the fire by taking away the oxygen element of the fire triangle and also be removing the heat with a very cold discharge. Carbon dioxide extinguisher can be used on Class B & C fires. They are usually ineffective on Class A fires. Dry Chemical is the most widely used type of fire extinguisher is the multi purpose dry chemical that is effective on Class A, B, and C fires. This extinguisher works by creating a barrier between the oxygen element and the fuel element on Class A fires. A small fire can turn to big if not quickly put off, it takes only a second for a smoke to turn to fire, therefore the need for a fire extinguisher everywhere necessary to save lives and properties. No one can deny the significance of these devices. Everybody is aware that fire extinguishers are designed to be used in a site of the fire, there are a lot of improvements that should be made actually. These flame safety systems are supposed to be utilised in case of fire that is not that enormous you will be able to prevent them from transforming into a huge one which could be difficult to extinguish already. Where To Buy A Fire Extinguisher in Nigeria. To buy a Fire Extinguisher on an online store, Kara.com.ng is the number one and the best online shopping website your choice of fire extinguisher in Nigeria at affordable prices. The reasons why you have to buy on Kara.com.ng are Fast delivery to your location in Nigeria within 24hours to 48hours, good customer support and ability to choose any mode of payment for your goods.